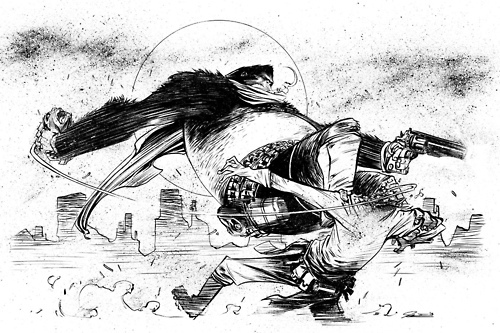 Six-Gun Gorilla might be my favorite book of 2013. Rarely, and I mean it, do I pick up a book based on title alone these days. Nine times out of ten if it isn’t in my pull list, I’m leaving it on the shelf. It’s just the way things work when you’re broke. That tenth time though, that’s the big gamble. The facedown card that’s about to determine whether you just wasted $2.99 on a comic or just added something new to your loaded pull list. Six-Gun Gorilla was that tenth time . Alternate history featuring gunslingers and ghouls — check. Genetically altered gorilla with cinder block-sized revolves — check. Insane artwork via one of the best up-and-coming artists around, Jeff Stokely, — that’s a check. Nearly every day of the week you can find Stokely posting to his blog Sketch Goblin for a taste of his beautiful, contemporary style. But aside from web clippings, Stokely has also lent his talent to the Fraggle Rock comic and the recently released Archaia title The Reason for Dragons. Stokely has partnered with some wonderful writers, but in all honesty, even if he was drawing Bazooka Joe comics, his style would blaze through like a lit match. I caught up with the artist to talk about, well, his amazing artwork and what it’s like drawing a six-gun slinging gorilla for a living. How did you first get involved in comics? I’ve always loved comics, and I’ve always wanted to draw them but my first brush with published work was with Archaia on their Fraggle Rock series. At the time I was interning with them and remember Stephen Christy looking at me one day, saying “Huh, you’re the first artist approved for a Fraggle Rock comic in close to 30 years, you’re the main artist on issue 1, and you’re the one person who’s never been published! So you’re the wildcard.” It was playful but also like saying “NO PRESSURE DUDE BUT YOU’D BETTER KILL IT!” I’m still very much proud of that work, oddly enough. 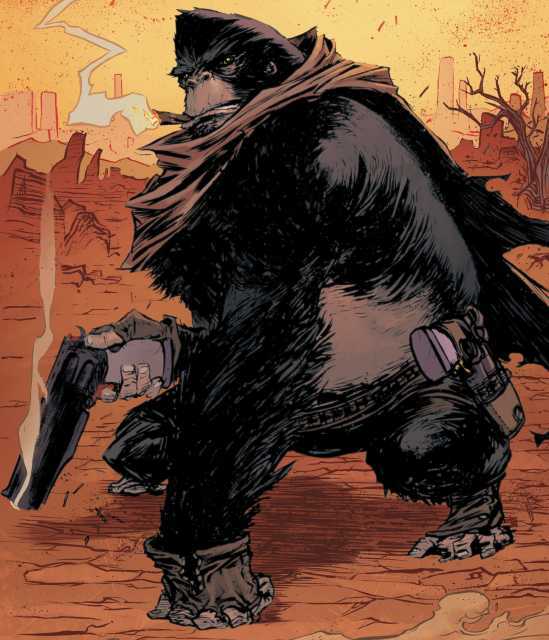 You and writer Simon Spurrier built such an interesting world around Six Gun Gorilla. What process went into crafting the SGG atmosphere and characters? When I read the pitch for this book (and very much the same with Dragons) the world, the characters, the overall atmosphere was very much present. Si has a knack for conveying the right tone and I felt it was all relatively easy to visualize, probably because it’s exactly the kind of book I’ve always wanted to draw. When designing the characters there was a bit of back and forth, a lot of it was everyone really encouraging me to to make the gorilla more of an animal with less human-like posture and that sort of thing. World building and concepts are always one of my favorite parts of making a comic. When a writer approaches you to work on a comic, what do you like to see from them? Full scripts? Rough ideas? Generally it’s nice to know the specifics first, like the genre, the tone, and the length of the project before diving into the script. But if it’s longer than a short, like a mini series, I like to read a more fleshed-out concept, usually in the form a full page of the overall plot, characters and setting. Then the script. As an artist, do you prefer a writer give you detailed scene descriptions or do you like them to keep it slightly open? I’ve worked from all kinds of scripts, in Dragons it was very much left to me to determine the staging and compositions, which I absolutely loved. In 6GG a lot of the descriptions were more lengthy but never too much, always used for world building purposes and I would rarely do something different than what Si had written because I knew he was just dead-on. Never overly verbose. If you’re working on a sci-fi book you obviously need the descriptions to know what the setting is or how extreme to go, fortunately Si and I seem to have really similar influences and we jelled really well together. Chris would also come over and we would really discuss how things should move on the page and he would just give me chunks of pages with no dialogue. So truth be told, I love both forms but only when they’re done right, which is very hard to do. You regularly upload sketches to your blog. How often do you draw? How does it help you as an artist? While working on Six Gun Gorilla I had 2-4 days off a month, so that’s a good example of how often hah! This sounds terrible and was in no way BOOM!’s doing, sure it was draining but I always told my editors that if it weren’t for my physical well-being I wouldn’t sleep. I’d just work because I love it so much. I’ve definitely grown while working on 6GG, it’s the biggest volume of work I’ve put out so far and it’s easily my best work. Hoping to continue pushing my self and try new things with each book, though. I do try to keep my work out there for everyone to see, without spoilers of course! The feedback is always really helpful and I think having it out there helps keep people aware that I’m still alive, even if it’s just a snapshot or something. Any advice for someone who wants to get into illustrating comics professionally or otherwise? I say this often but I stand by it: Draw what you want and do it a lot. If you want to draw monsters, draw monsters. If you want to draw superheroes don’t let anyone stop you. Do it long enough and eventually you’ll get better and the better you get the more recognition you will receive so it might as well be recognition for something you love doing. Also, learn the basics, it never hurts and only helps. Every so often, we either come across or are sent an independent project that we feel – being starving artists ourselves – deserves a little recognition. 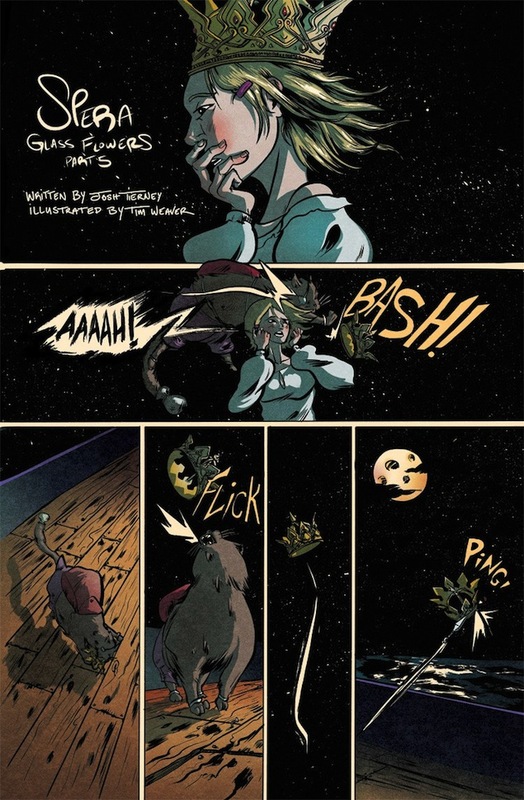 Recently, comic artist and writer Lee Milewski tipped us off about an independent comic beautifully titled With The Earth Above Us. With The Earth Above Us is somewhere between Blade Runner and 2001: A Space Odyssey mixed with an oppressive air of isolation and rendered in grey scales. Lee is currently seeking funding over at Kickstarter to help him complete this 70-page B/W graphic novel. It is really a beautiful tale of isolation and paranoia wrapped in the cold metal hull of an interstellar spacecraft. That said, check this book out, give Lee some support and head over to the official Kickstarter. To help flesh out this comic a little more, we got together with Lee via the magic of email to talk about With The Earth Above Us and the perils and perks of self publishing. Why did you choose Kickstarter over Indiegogo? IndieGogo has many limits towards it’s overall presentation, though I’d say the primary reason is due to popularity. Kickstarter has so many projects going on at once, which means that you have tons of people who come to the site and check out your project as well. I also enjoy the “all-or-nothing” concept that Kickstarter goes by, which makes it a much more intense and exciting thing to be apart of. Why did you choose to self publish? Self publishing allows me to keep my identity, I guess. I love that my book can look, feel, and go exactly where I want it to; And the fact that my ideas are the only ones which affect the end result is great! What are some of the difficulties you have encountered? The main thing that I’ve found to be the most difficult for my own personal growth, which probably comes off as a little odd, is getting my name out into the wide world of independent comics. In fact, before this campaign, I hadn’t really shown my stuff around. It really was a challenge to get out of my comfort zone. What do you think are the benefits of self publishing? The benefits largely consist in being able to direct your project whichever way you choose, which is great. Unfortunately, you do lack advertising (unless you shell out your own money), but you can make that up by joining in on the many conversations that consist to help spread the word on independent comics. There are many forums to use, along with Facebook/Twitter/etc., which allows for a person like myself to reach a wide audience. I was first introduced to Eleanor Davis’ work after someone posted one of her short comics at an illustration blog. The comic, The Beast Mother, is a black and white mini-comic about a monstrous creature who seems to have kidnapped children and is now raising them as her own. While its cutlass and pistol-wielding hero echoed sword and sorcery, the comic resonated on a deeper level for me. It’s a strange mix of a stand alone hero story blended within a universe that is deeply grim and brimming with untold history. The same can be said for much of Davis’ work. Her projects, even when presented as simple story, are loaded with a sense of a real past. We are rarely told the whole tale, but that’s the point. Her comics are meant to present us with a portion of time, a sliver of history shadowed and hidden. We aren’t the archeologists digging into Davis’ work. Instead, we are the museum patrons gazing at dinosaur bones from a distance. 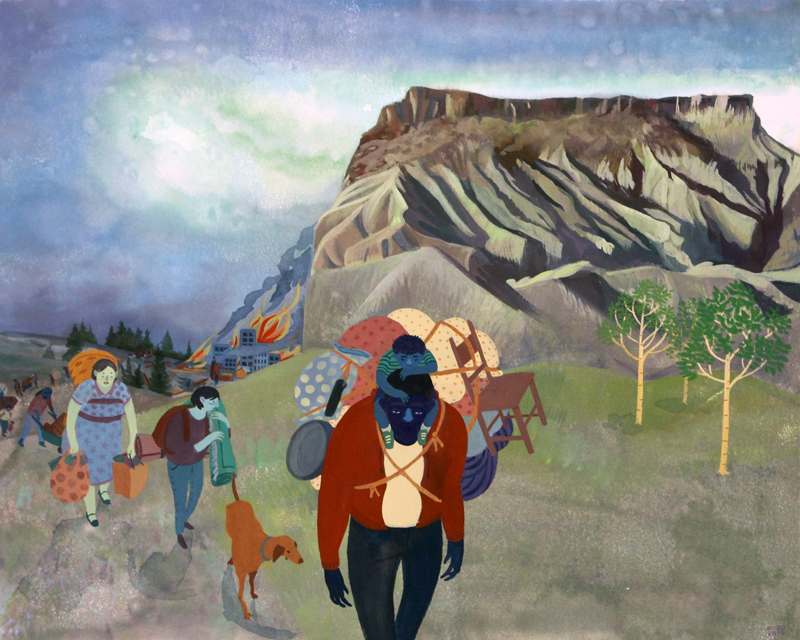 I spoke with Davis recently about her career as an independent illustrator and artist. She imparted some really brilliant knowledge about creating not only comics, but artistic expressions. Davis also included an FAQ she shares with students, which includes some choice advice regarding a career in illustration. We’ll add a few questions from that at the bottom of the page. I’ve read that you’ve been drawing and writing comics practically your entire life. What attracted you to comics as a young person? My family has always been into comics. I grew up in a house full of them – my mom collected Little Lulu, my dad was really into Pogo, Popeye, Little Nemo and all the rest. I read and re-read all those comics until I had them memorized. I’m not sure if I was drawn to them because I had an innate love for comics, or if my love for comics came from reading them so much? You’ve primarily worked in independent comics or self-publishing. What about indie comics appeals to you over something more mainstream? I’m not a mainstream lady, I guess. I like the rawness and punkiness of indie comics. I like that indie comics don’t tend to be gender-normative; that’s very important to me. And although I see the value of fantasy & escapism, it’s not what I’m interested in exploring in my own work most of the time. I’m mostly interested in making art as a form of self-expression, & indie comics has a strong tradition of that. You style has a dream-like quality akin to that of Winsor McCay. How did you develop your specific artistic style when drawing comics or creating illustrations? Thank you! That’s high praise. I draw what feels true. I draw dream-like images because life is dream-like. Do you first remember when you knew you wanted to pursue comics professionally? Was there a watershed moment that steered you in that direction? I’m not actually a professional cartoonist, depending on your definition of professional. I’ve tried living off of the money I’ve made making comics in the past, but it was too hard! Too much work for not enough pay. Now I make a living doing illustration and I make comics for myself. I think I realized that I was making comics that were good enough for other people to be interested in reading maybe my Junior year of college. Some cartoonists I really admired – Chris Wright, Lance Simmons and David Youngblood – asked me to put together a mini with them. That was thrilling, to get that sort of affirmation. But before that, I never doubted that I would be making comics. I just didn’t know if anyone would be reading them. We have readers who are artists and would likely be interested in your process. How do you develop a comic like The Beast Mother from start to finish? I did the Beast Mother my junior year of college, I think. I was in a psych 101 class & drew this image of a giant woman-beast covered with babies. As soon as I drew that image, I knew what the story would be. I just had to sort of shake it out. I thumbed the comic out in a day, then had my husband (boyfriend, then) Drew Weing read them & I edited it a bit. Drawing the whole thing took about a month, I guess. I wasn’t very fast back then. I remember all those pine trees being a real headache. Do you have any advice to impart on up-and-coming comic creators? What would you go back and tell yourself? Would you go back and tell yourself anything at all? A young illustrator just asked me this question; it’s a good one. Here’s what I told him, about a month ago – not much has changed since then, but ask me again in another month! I don’t know what advice I’d give myself. My career trajectory so far has been irritatingly round-about and inefficient, but I think maybe I had to do it like I did. The big mistake I made was rush into things too fast at first & burn myself out. I tried to embark on a long series of graphic novels – my kid’s GN The Secret Science Alliance was supposed to be the first in a series – when I wasn’t fully developed as an artist yet. I signed a two-book contract & only did one book and it’s been a real headache since then. But that’s a choice other artists have made and it’s worked out very well for them. Figure out how to be happy and have fun. There are easier ways to get love and money so if you aren’t having a good time you should rearrange your life and work process so you are having fun, or you should quit. There’s no shame in getting a part-time job. If you aren’t strong & developed as an artist & you’re trying to make a living right away, you’re not going to make the work you want, you’re going to make work you think other people want. And that work will not be very good. If you focus on making the work that excites you, that’s important to you, that will be your best work. And then you’ll get jobs. You might need to buy time to focus on that, and in that case getting a pleasant low-key job that will get you out of the house & around people will take a lot of the pressure off. “Don’t try to imitate another artists’ voice. Find your own voice. And don’t go looking for your own voice. Just draw and think and draw and think. Don’t harden your heart. Don’t avoid pain. Feel those feelings and draw them. Your voice it will come out on its own. Then, when it comes out, trust it.” That’s what I would tell myself. That’s what I would tell anyone, I think. What advice would you give to an illustration student? My advice is to have a simple, professional website that you update frequently, a decent web presence, and constantly, constantly strive to produce the best, most interesting, most honest work you’re capable of. Don’t try to do what you think other people want. You simply won’t be able to produce your best work that way. Make art that speaks to you and comes from your heart. Be true to yourself. Remember why you’re doing this. Also, live cheap and get a part-time job. Don’t think you have to make a living on art right away. It’s okay not to. Once you build up enough clients decide if you’re ready to live off of art alone. What do you think of the current trends in illustration and where do you think this field is heading to? I have absolutely no idea. I don’t think anyone does. People have told me I’m part of a new wave of illustrators who get more professional jobs through art directors seeing their personal work. I think that’s really neat and I’m excited to have had the opportunities I did. It’s truly no surprise critics and readers are flipping their proverbial lids of this series as it’s unique blend of vignette-style storytelling is like nothing you’ve ever read. Instead of telling a straightforward narrative, writer Josh Tierney with the help of dozens of artists, has crafted three volumes of Spera like a photo album full of snapshots detailing his characters’ journey. This series isn’t always on track (the key storyline involves two rogue princesses searching for adventure), however, Spera shines for its flights of fancy with brilliant writing and an extremely rich sense of the world it inhabits. I can’t praise this series enough. 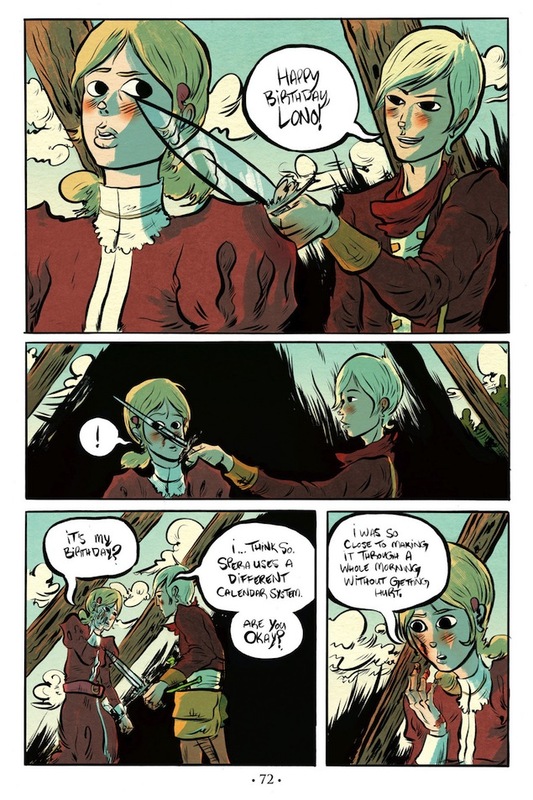 Luckily, Tierney and a key Spera artist Kyla Vanderklugt took some time out of their naturally busy schedule to catch up and chat with Panel Bound about Spera, webcomics and everything inbetween. Spera is one of the more innovative comics to come out in the past few years. How did this project get started? Josh Tierney: I had written a novella of the original story in 2009 and wondered what it might look like as a comic. Before Spera I worked on various online projects that combined prose and illustration, where different artists would illustrate different chapters of novellas that I wrote. 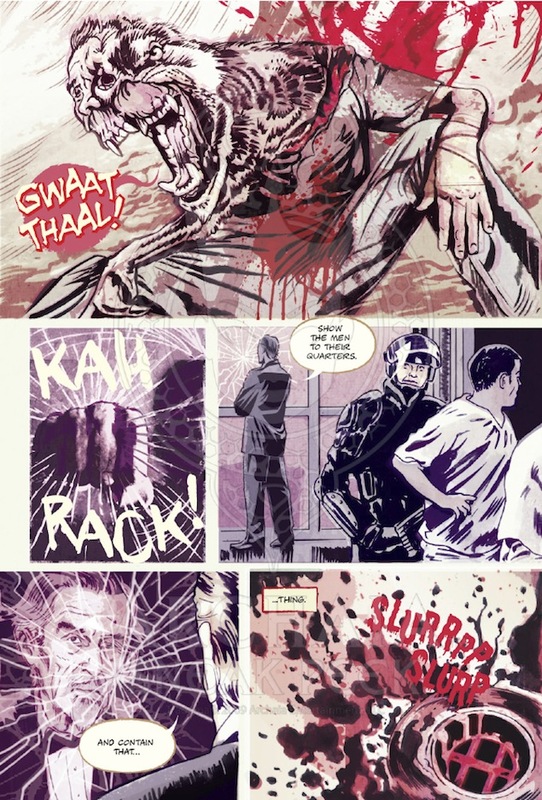 Comics seemed like the most natural extension of this format, and so I brought in many of the collaborators from the previous projects to help adapt the novella into comic form. Since then I’ve focused my writing efforts almost entirely on comic scripts. Each volume of Spera features a wide range of artists. How has this changed the way this comic is written, if at all? Josh: If the artists are set beforehand, I’ll write each chapter to what I believe are the artists’ strengths, or at least what I like most about the artists’ works. If the scripts are written beforehand, I try to give each chapter a different feel, so that I can then seek out the most suitable artist for them from there. Kyla, as an artist on Spera how do you maintain the continuity and tone of this story while working with several other artists. Kyla Vanderklugt: A lot of the credit for this has to go to Afu Chan. His distinctive character designs are easy to recognise throughout all the shifts in technique and style, and that really helps to tie the chapters together. As for the environments, the designs are often established by the first artist to tackle a particular section. When I drew my pages for the second chapter of Vol. II, I used Giannis’s interpretation of Kotequog as reference, since he’d already finished the first chapter. The lore and world of Spera is so expansive and detailed, it almost reminds me of a fantasy-driven Prophet, where is inspiration coming from for this book on both the written and art departments? Josh: Old school console RPGs on the writing side. Spera is a chance for me to indulge in everything I like about RPGs, such as town exploration, treasure hunting and random monster battles. The characters are basically leveling up with each book. I’m also a fan of Studio Ghibli films, and their sense of magic and mystery, along with their amazing female protagonists, have been an inspiration for sure. Kyla: One of the great things about this project is that all the artists come from completely different backgrounds, so what inspires and informs Spera’s art style changes with every chapter. A common thread, though, is that we all love fantasy in some form or other. It’s also getting to the point where I can refer back to Spera’s lore itself for inspiration. Some background characters in my Vol. III comic are decorating a cake with bugs – Pira and Lono ate enough bugs in earlier chapters that I figure bugs-as-food counts as Spera canon, now. Josh, why work so many different artists on this book? Wouldn’t it in some ways be easier to work with just one artist? Josh: Having multiple artists means less pages for each artist, which means each artist can put the maximum amount of effort into their chapters. There are also a great many artists I’d like to work with, but it would be impossible to work with them all on individual projects. On Spera, I can work with everyone all at once, and do it on a project I’m very passionate about. I also personally find it fascinating to see the same characters rendered by different artists within the same story. Everyone sees the world differently, and I feel like Spera’s structure is a kind of visual approximation of this. 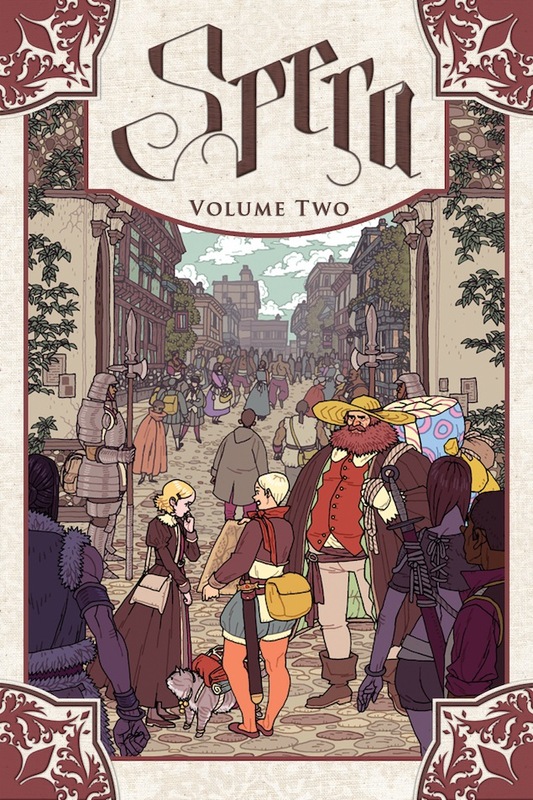 Volume three of Spera is now being collected on comiXology, how has the process of putting together this comic evolved since Volume one? Josh: The more I work with artists, the more I learn what to put into scripts, including what not to put into them. The Vol. 3 scripts are probably the most detailed so far, leading to comic pages that are more in line with what I was thinking when I wrote them. As both a writer (Josh) and an artist (Kyla), do you recommend aspiring creators start on the Web? What benefits does web publishing offer? Josh: Publishing on the web is the best way to get your work to as many people as possible. Most of the published artists I know today were first discovered on the web. Webcomics are being treated as seriously as print projects by every editor I’ve spoken to, and are often the first place independent comics publishers will look to for new projects to pick up or creators to hire. Kyla: There are probably as many different ways to start a career in comics as there are comic creators, but sharing your work on the web definitely does give you a big advantage. Aside from the exposure, it puts you on common ground with other comic artists, art directors, and editors. Everyone browses the web, after all. Any advice for aspiring comic creators? Josh: Don’t give up. It could take years before you have a successful project, but during those years you’ll constantly be improving. Post your works on whatever social networks are available to you — this is the best way to gain support for what you’re doing. Kyla: Take inspiration from everywhere. I mean, from other comic artists, obviously, but don’t stop there. Don’t be insular. If people haven’t checked out Spera yet, why do you think they should, and where can they pick up a copy? Josh: If you like the sound of princesses going on dangerous adventures with a giant flaming dog and super tough warrior cat, all of it illustrated by some of the coolest artists on the planet, then Spera is the series for you. It can be found wherever comics and books are sold, including online retailers such as Amazon and the Archaia store. Kyla: There really isn’t anything else quite like Spera on the market. And aside from the novelty aspect… there’s a fussy middle-aged man who turns into, yeah, a giant flaming dog. Something for everyone! And we’re back. It has been a while, but Panel Bound is back…back with a vengeance. Luckily in our vengeance-seeking, we were able to set up some time to talk with the astonishingly talented team behind the Archaia graphic novel Feeding Ground. The creative trio of Jonathan “Swifty” Lang, Michael Lapinski (great comic advice blog here), and Christopher Mangun, as I’ve heard at several “how to pitch a comic” panels, put together one of the best comic pitches the gang at Archaia had ever seen. We figured if you’re coming to Panel Bound to read about how to pitch your book, why not learn from the best there is? So, we asked team Feeding Ground about it and they were kind enough to oblige. After checking out this pitch, you’ll agree that this is how it should be done. If you’re looking for a template, a gold standard in pitching then read on, this is the interview for you. Also, check out Feeding Ground, it’s about werewolves, which in my book is always a Michael Jordan circa 1986 backboard-breaking slam dunk. It’s been said that the Feeding Ground pitch is one of the best the team at Archaia has ever seen. Did you guys go into pitching the comic with any previous pitching knowledge, with comics or otherwise? Michael – I come from a background working as an artist on children’s television shows like “Blue’s Clues” and “Teenage Mutant Ninja Turtles” when it was on Fox. There was a while when, besides my day job, I was constantly pitching new show ideas. Some made it through early stages of development, and one aired as a pilot, but “pitch book designer” became a craft unto itself. Chris was the man responsible for making our finished book look and feel as swanky as it did. Chris – At the end of 2008, Feeding Ground evolved from concept into a full plotted story with characters and specific design. We knew we had something worth showing to publishers and the opportunity presented itself in NY Comic Con of February 2009. A month before the con we decided we would leverage Michael’s art, Swifty’s storytelling and my production skills to create the pitch book. For years I’ve worked in the advertising world which demands a its own level of presentation craft and for years it was my job in small studio to create compelling well packaged pitches for companies like Pfizer and Bayer. Marrying these skills of print production with some heavy stock-full color paper and a Look-book style (common in the film industry with scripts being viewed quickly by producers and media companies) seemed like something that would best showcase our story series quickly to an editor (which Mike did an amazing job of using to engage Archaia at NYCC). Swifty – My background in visual storytelling is rooted in film (I studied film studies at the University of Amsterdam). I had been writing since I was a kid, but hadn’t really tackled comics before. As far as comic reading, I truly grew up reading Mad Magazine. Sergio Argones and Jack Davis were some of my favorites. My pitching experience, and this is the chief responsibility of a writer, is to get other talented people hooked on a concept. I had to do this working with directors in theater and simply trying to convince friends to read my work. Translating this into a visual package was unchartered territory. While I had a very strong sense of what I imagined the packet might look like, I lacked the experience and technical knowledge to manifest this. Chris and Mike are magicians. The Feeding Ground pitch features an incredible amount of detail and planning not often seen in comic pitching. Why go about it this way? Did any past experiences foster this pitch’s detail? Michael – I’d say past experience informed the intention to make the book a whole, complete, package but it was Robert Kirkman’s guidelines in a reprint of Walking Dead #1 that laid out what we should include. Chris – After 2 weeks of work, our pitch book was finished with roughly 40 pages of content: a synopsis, a series beat breakdown, a map of our story setting, character designs, sample art, cover art and a sample our first script. Swifty – Something we believe as a team very strongly in is the concept of “curb appeal” that one experiences in real estate. From the moment one pulls up to the house, the buyer should have a strong, visceral reaction. 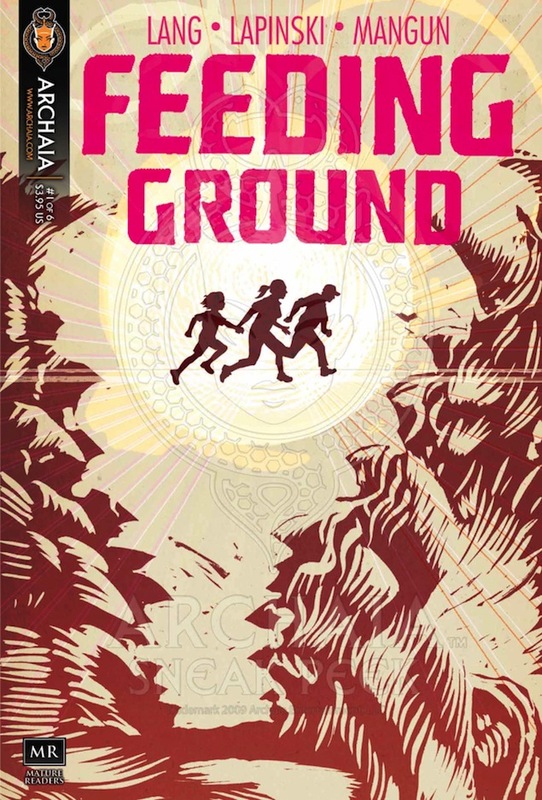 When someone picked up our book, it was important not only that Feeding Ground conveyed our narrative, but we knew our world so thoroughly we could drop a reader into it. The more firmly that the aesthetic demonstrates the act of conscious decision making, the more trust a publisher will have in a creator. You saw our cover and you knew right away the landscape you would be traversing. In your opinion, what is the best thing a comic team can do to get their pitch looked at, let alone picked up? Michael – As best as you can, know who you are talking to. Before the show, I researched what different publishers were printing and who I’d ideally talk to. You save yourself a lot of time and fuss just by having some sense if your material is right for someone and what their pitching requirements are, often posted on their website. Swifty – Be assertive. The odds that someone will stumble on your work amidst all the amazing content being made is unlikely. Be a champion of your ideas and confident . I can’t tell you how many people I see sitting in artist’s alley waiting to be discovered. It may happen that way, but there is something about reaching across the table that is powerful. Practice your elevator pitch on friends. If you can tell someone in a sentence what makes your story unique it increases the likelihood that you can do that for an editor. Originally, it has been said that Feeding Ground was planned for a movie. How has transferring it into the comic medium been different with both mediums being so visual? Swifty – After a couple of sessions with Chris and I attempting to tackle this as a screenplay, it became clear that film was not the ideal medium to tell this story. It was simply too vast and the absolute freedom that comics allows was magnetic. Mike and I had a very specific set of visual concerns and an understanding of how this story could be best represented. I think what comics allowed us to do was be very specific about our graphic references (in this case EC Comics meets Mexican Day of the Dead iconography). Whenever a story is created, I really think it’s important to consider not only the what, but the why. Why should something exist as a book, as a physical object, versus a novel, or a screenplay. For us, we wanted Feeding Ground to appear as an old object that conveyed a mythology, almost as if someone stumbled upon it within a barren landscape. Michael – I’ve been a comic fan since pre-school and I had done comic strips in college but got excited to do my own comic when I saw a number of friends self-publishing their books. I’m also a horror fan and the story for Feeding Ground immediately appealed to me as staking out new territory. Swift and I are both into EC Comics and the woodcut prints of Jose Posada and wanted to illustrate a print object that was a marriage of the two. Presentation is everything and, like Swift said, we created a visual style that was as sun-baked and broken as the story. Michael – When you look at the list of what we included, it’s really about including as much as you need to take what’s in your head and present it on paper without actually showing up with a fully completed book. Especially with including the cover designs, the goal is to place something in a publisher’s hands that conjures what will be on the stands. By printing and binding the book as a traditional comic, I think it made it even easier to visualize. All said, you leave enough evidence that you could get the job done. Chris – Getting story right from the start is important. Tell people about your story, they will let you know what’s working or not. Since there’s not a ton of time invested at this stage with production, which can eat up a year plus, it’s easy to move ideas around, cut and slice or invent characters. Having that conversation with a small audience and sharing with peers early on is key to knowing if your “elevator pitch,” a two sentence synopsis, the story and overall materials are working for or against you or simply require just a little more editing. We actually practiced and targeted our elevator pitch prior to Michael going to NYCC to ensure we all were on the same creative page, but also to see how our concept held up in other peoples’ minds on the fly. Swifty– Even though your script will be revised (both internally and by an editor) I think it’s incredibly important to demonstrate that a writer knows how to complete a story. A complete script showcasing an ability to tell a story both panel-to-panel and with a narrative arc is essential. Mastery of all of the elements of storytelling (dialogue, panel description, establishing character moments) are necessary ingredients to gaining the confidence of an editor. An understanding of the larger beats and how they fit into the complete story is equally important. You are taking the reader on a ride and you must know where the exit is. Reading the Feeding Ground pitch story, it would be easy to say you were very lucky. However, in reality, it seems that it was a combination of extremely hard work and a little luck. Do you believe that a team needs luck? Or can they thrive on virtue of their hard work alone? Michael – What’s the quote, something like “Fate is when timing meets preparation.” The fortunate timing in our history came when I was taking a break from talking with publishers on the Comic Con floor and inadvertently found myself talking with Stephen Christy, the editor-in-chief at Archaia, while I was just browsing their table. I thought I was just having a passionate conversation about comics with a salesperson. Even with my handy list of publishers, Archaia wasn’t on my radar at the time and soon I found myself handing over the pitch book and I was all set to talk about it as it made it’s way up their chain of command. To this day, they’re still great about making time to meet with aspiring creators at conventions in their swanky library of a booth. Swifty – I agree to a certain extent that one makes their own luck. If you don’t do the work, nothing will happen. A strange thing occurs when one keeps pushing ahead, and I don’t mean to sound too mystical, but the effort attracts opportunity if the intention is pure. We truly did this for the love and that came through with all of our interactions. We stayed humble, and we stayed open to possibility. The right people emerged. My luck began when Mike and Chris wanted to partner with me. From there, as a united front, all things became possible. If there were a recipe to guarantee the opportunity to get work out there, I certainly do not know it. I do know that you are only as good as your team and being someone people want to work with greatly increases your chance for success. If people haven’t read Feeding Ground yet, why should they now? Swifty – Feeding Ground rose from a conversation between myself and a good friend of mine, Thomas Peyton, who is a documentary filmmaker. He had been working for the past couple of years on a documentary about border crossing. What struck me as remarkable about his story was his desire to put a face to the numbing statistics we hear about people crossing the desert. Even a second-hand account proved far more harrowing than anything I could concoct. We also tossed around ideas about the most underutilized mythology during the horror renaissance. He believed it was the werewolf. I couldn’t argue. The silly talismans and mythology hungered for a reexamination. 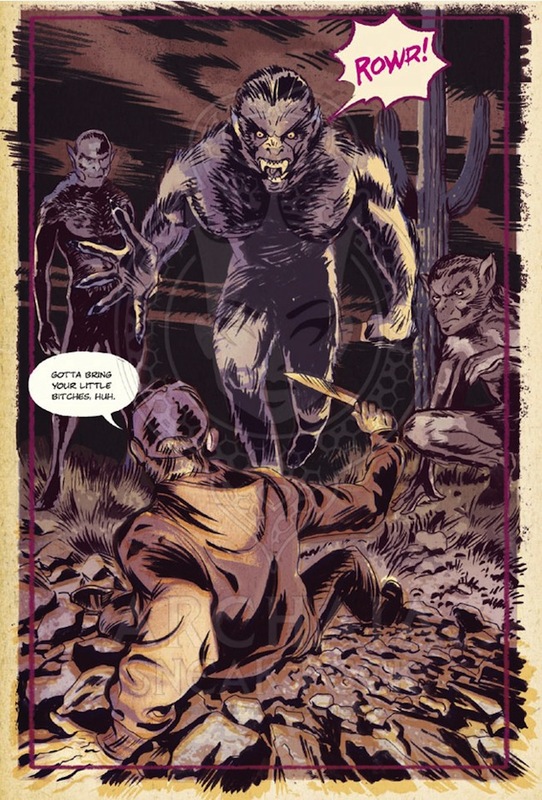 The legend of the werewolf coupled with the horrors of a man crossing the Mexican border proved revelatory; there was a genuine “a-ha” moment that I think translates into a modern myth of transformation. Feeding Ground is vital in that it examines one of the most important issues that define our country; the role of immigration and what it means to sacrifice for opportunity. This is the story of America. Yet, this is also a story that resonates on a universal level. It asks the question, what would you do to save your family. The stories I most admire are both uniquely linked to their current historical circumstances and ask questions that are timeless. Mike likes to say that some of my best ideas are “myths of the moment”. I agree, but the reason that we still watch shows like the “Twilight Zone” is that anxiety and fear of the unknown have no expiration date. I hope readers recognize this in the work. Any last minute advice for aspiring comic creators? Michael – If you don’t know it already, comics are an extremely time consuming artform. Your work will most likely be a labor of love so make sure you believe in it before sitting down at your drafting table. But, the sooner you get something on paper, the sooner it becomes a reality. Beyond that, the comic community is relatively small. You’ll learn a lot just by being nice and engaged with other creators of every level of experience. Swifty – Your energy and enthusiasm for your project must be boundless. If you can’t communicate the urgency of your need to tell your story, you will not find the artists who will best bring it to life, you will not find the publisher who will shepherd it into the world. Be kind to everyone you encounter, creator and fan alike. Their support is essential to completing your work. You may meet someone who can offer a piece of advice that will propel your project forward or make an introduction. Accidental mentors are there. Don’t be a jerk. The creative trio of Jonathan “Swifty” Lang, Michael Lapinski (great comic advice blog here), and Christopher Mangun, as I’ve heard at several “how to pitch a comic” panels, put together one of the best comic pitches the gang at Archaia had ever seen. We figured if you’re coming to Panel Bound to read about how to pitch your book, why not learn from the best there is? So, we asked team Feeding Groundabout it and they were kind enough to oblige. You can check out the Feeding Ground pitch packet here courtesy of the team. In the spirit of honesty, I have to say that webcomics typically don’t really do it for me. Being a lifelong lover of comics, the introduction of self-published, Manga Studio-centric webcomics made me uneasy to say the very least. It’s the ol’ double-edged sword: on one hand, the web made publishing comics accessible to everyone. On the other hand however, the web made publishing comics accessible to everyone, literally everyone, or at least what feels like everyone. Everyone I know is working on a web comic (myself included). The market is oversaturated and more often than not, the comics aren’t totally awesome. It’s for these reasons and more that Battle Creek, NE was such a pleasure for me to read. Created by writer Mike Steele (great name) and artist Julia Philip (less great, but only because you can’t trust someone with two first names), Battle Creek, NE is young but promising regularly updated web comic. 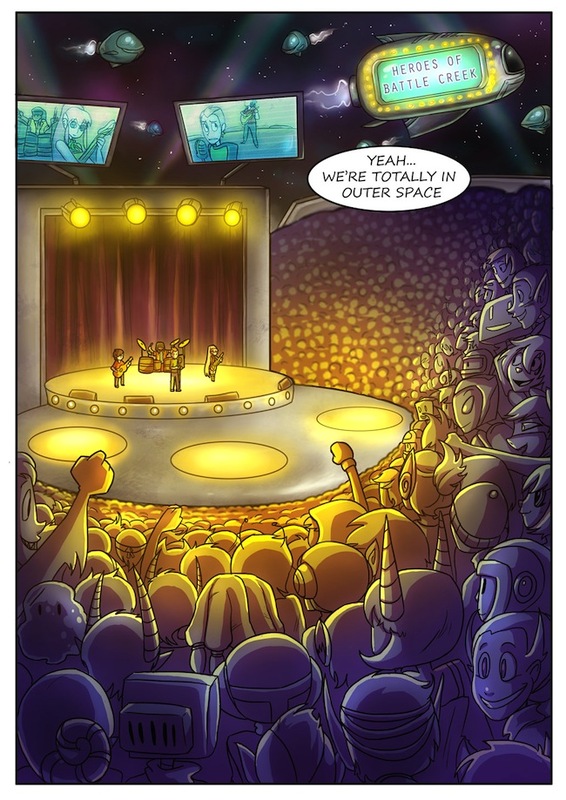 I won’t give too much away because you can head over to BattleCreekNEComic.com right now and check it out for yourself, but I can tell you that an intergalactic battle of the bands may be involved. 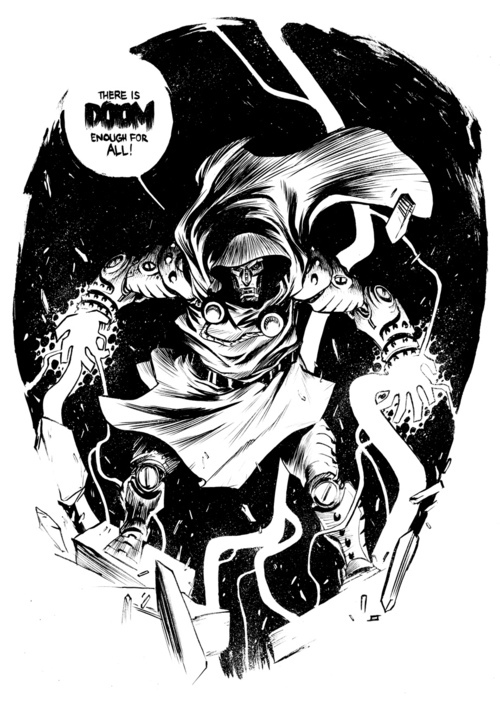 It’s great stuff (this Geeks of Doom review written by a staggeringly handsome young journalist says as much), which is why speaking with the comic’s creators was such a blast. I caught up with Steele and Philip to speak about the finer points of web comics and getting noticed in the brutal world of digital publishing. Why did you decide to put out Battle Creek, NE as a web comic instead of pitching it to publishers? Julia: I personally read more online comics than I read comics I buy. I also think that doing it as an online comic we can more easily build a fanbase, and maybe then consider selling it, knowing we’ll have people buying it. Mike: The idea of pitching the idea to a publisher never even crossed my mind. Maybe it’s just me not knowing how I could even start a process like that, but in my head, this was always gonna be a web comic, down to the way we structure the pages and everything. (if you were to put all the pages in a regular 24 page comic type format, I would imagine people would notice the gaps in time that sometimes pop up between pages). How did you and Julia start working together on this comic? Mike: Julia was dating someone that was a regular listener of my weekly podcast (jim and them) and so she started listening to it as well. We eventually became friends on Facebook and I had complimented her on her art in the past, even asking her to do some art for the show a few times. She eventually asked me if I’d ever be interested in doing a comic with her at all. I was thrilled when she asked because I’ve always enjoyed writing, comics, and web comics but never had the art chops to do anything about it. I pitched her the idea I’d had for a while that became Battle Creek, NE (at the time I just called it The Battle of the Bands) and it kind of went from there. Because there are so many web comics online, it is often hard for creators to get noticed. How are you making sure that Battle Creek, NE gets out there and gets noticed? Julia: I mostly make posts about it on my Deviantart and Tumblr etc. and hope that people will notice it. Mike: It helps that we both had existing audiences from the get go because of her presence on Deviantart and the existing listeners of my weekly podcast. Having had a bit of a built in audience from the get-go made spreading it around social networks like Facebook and Twitter a lot easier. I’ve also made sure to get us on a few of the more popular web comic portal websites (Comic fury and Smack Jeeves), which has done a good job of giving complete strangers a place to find our comic who would be unlikely to stumble across our website. Everything else I’m sort of just winging it on: Requesting reviews online, befriending other artists online and most importantly continuing to update the comic on a regular basis. Mike, you’ve focused heavily on character development in this comic. Why is this so important to you, especially in the medium of web comics, where characters are often neglected? Mike: Well, you pretty much said it yourself right there. 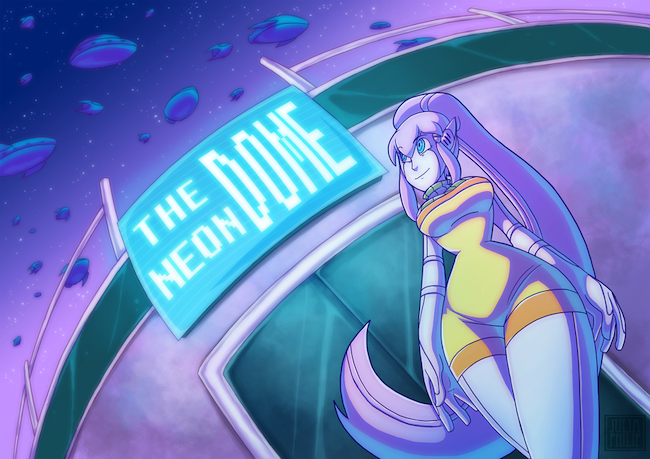 I think there is a bit of a web comic renaissance going on these days, where you can find professional quality stories and art in web comics, and I wanted to be a part of that. 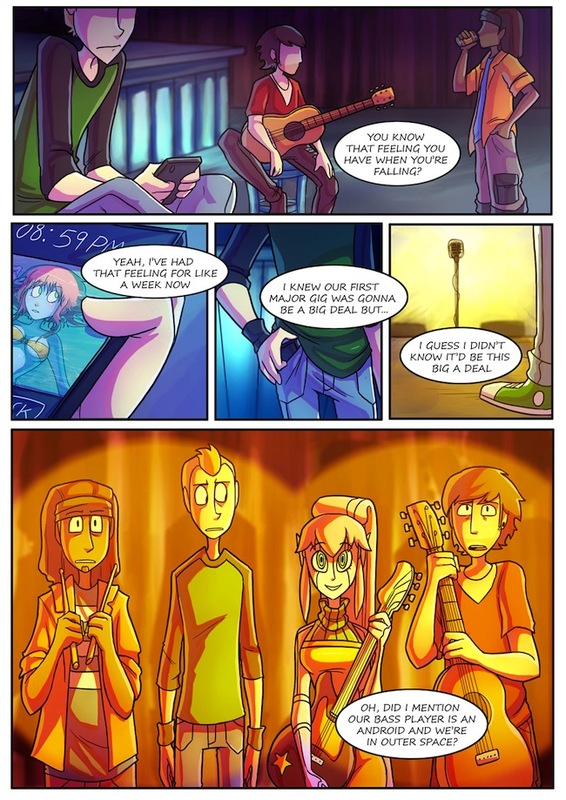 You can close your eyes and randomly type a word into google and find a 3-4 panel gaming comic, and don’t get me started on how annoyed I am the amounts of garbage rage comics there are flooding the web, but you have to try a heck of a lot harder to find someone telling a good story. On top of that though, it’s just always been the way I wanted to write. Whether it’s short stories, message board RP’s, D&D or whatever, I’ve always enjoyed the character creation and interaction part of writing. Since I have no formal training in writing, outside of what I learned in high school, I don’t think I’m great at it just yet, but it’s nice to know a LITTLE bit of what I’m trying to do with these characters is coming through. Julia, how did you come up with the designs for the various alien species in this comic? Julia: I try to just do whatever comes to my mind. I know that Mike and I both kinda agreed on that we didn’t wanna go too crazy with the alien designs, keep them mostly humanoid. Mike wanted to have the characters of them shine through rather than just having them be interesting because of how they looked. I like keeping the designs pretty simple. Just including features to a basic humanoid idea or a funky skin-colour is usually enough. I know Mike’s only concern was that we make sure they don’t stray too far into the realm of “Fantasy” looking characters, but I think we’ve done good at avoiding that so far. How do you guys work as a team? Julia, do you prefer Mike write out direction in detail or leave room for you to stretch artistically? Julia: I like it when he describes the things with a lot of detail, as much as he can give me. I hate making mistakes because I might have misunderstood something. Usually I handle more of the environment based direction myself though, since as a writer there is really only so much you can say to convey the blocking of how a page is set up. I know Mike always says he feels like I can read his mind though, because so far he says stuff tends to look exactly how he pictured it. I also love pages that have very little dialogue, it leaves more room for me to do more fun things with the characters. Mike: For the most part we use Skype, Livestream and Facebook. I won’t lie and say its exactly like being in the same room, but as far as the fact that I live in Las Vegas, NV and she lives in Sweden, I feel like we have a nice utility belt of tools that that allow us to work on stuff together in a way that definitely doesn’t feel like were on opposite sides of the planet. When we can hop on Skype and she can stream her Photoshop on Livestream for me in real time, it becomes pretty easy to work on laying out pages and designing characters together with nothing lost in our distance from each other. Mike, how do you usually write your scripts? Similar to the way traditional comics are written or different for Web? Mike: I basically write them like a mix between a short story outline and a screenplay. I break out out dialogue and directions of characters, facial expressions, their more subtle feelings, and position of the characters when its important. When I feel like that stuff should be more organic though, I’ve found that Julia is very good at taking a little bit and filling in the holes the way she see’s fit in a way that I’m always okay with. Julia is excellent with body blocking, facial expressions and expressing emotion in the ways she draws our characters, so sometimes it can be a strength to let me leave that stuff to her. Julia: Try and keep moving on. Your first comic pages will always look terrible, so don’t go backwards and try drawing the first ten pages over and over, you won’t get anywhere. Try and push yourself to do things you’ve never done before, and don’t avoid drawing the backgrounds (people always ignore backgrounds!) Your readers can easily lose track of where the characters are. Mike: Don’t kill yourself over the small stuff. Take your idea, break it down into a few broad pieces and just go with it. You’re always gonna end up wishing you did something different (I can’t count the amount of things I think are awful in some of our early pages that I’m sure no one EVER noticed) but the more you put put there, the more you’re gonna just naturally get better and feel more comfortable doing. Also, don’t be afraid to try something different. There is no better feeling of satisfaction, than to be told that you’re doing something creative and unique. Everyone I know is working on a web comic (myself included). The market is oversaturated and more often than not, the comics aren’t totally awesome. It’s for these reasons and more that Battle Creek, NEwas such a pleasure for me to read.